If you stop by the High Line during the colder months of the year, there’s no way you can miss Red Sprite winterberry, Ilex verticillata ‘Red Sprite.’ The vibrant red berries of Red Sprite winterberry are a colorful contrast with the subdued tones of dried grasses that characterize the High Line’s winter landscape. 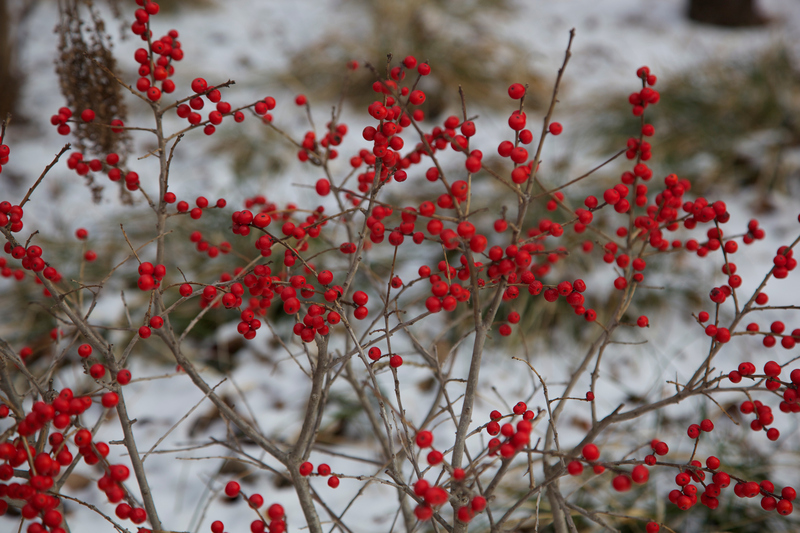 In addition to being a beautiful ornamental shrub, winterberry’s prolific fruit is a great source of food for native and migrating birds. High Line Staff have even observed mockingbirds guarding the bushes from other winged competitors so they can keep the coveted food source to themselves. Behind the scenes, interesting biology is at work with Red Sprite winterberry. Unlike most plants, many hollies are dioecious, meaning each individual plant is sexually distinct and will only create male or female flowers. Ilex verticillata ‘Red Sprite’ plants are all female and would not produce their characteristic red fruits without first being pollinated by a male counterpart. To ensure bountiful fruiting, High Line Gardeners have planted Ilex verticillata ‘Jim Dandy’ in close proximity and natural wind pollination does the rest. On the High Line between Gansevoort and 14th Streets, and between 20th and 23rd Streets.